With the advancement in heating and cooling technology employed by Daikin in its extensive range of products, homeowners and business owners alike can monitor and control their indoor air comfort on a 24-hour basis. To top it all, it is possible for a person to follow their indoor air controls even when miles away from the premise through the programmable system controls for as long as they are anywhere with an internet connection to ensure indoor comfort at all times as well as peace of mind. One of the greatest advantages of a Daikin Nest thermostat is the fact that an owner doesn’t need to program it now and then as it stores the temperature set in its memory to come up with a personalized schedule. In the event room is empty, the Nest thermostat turns itself off as a means of energy conservation. This thermostat allows homeowners to adjust temperature settings from their laptops, smartphones or tablets. This thermostat does a lot more than sound an alarm when there is smoke or carbon monoxide danger in your home. It speaks to a homeowner informing them of the danger and the exact cause of the problem. If for example there’s only a little smoke such as something burning in the oven, it also notifies you. Additionally, the Nest Protect ensures a homeowner is always confident of its working condition by regularly checking on itself and also displaying a green color once the lights are turned off. This system is also integrated with a homeowner’s mobile device and notifies them when the batteries start running low. 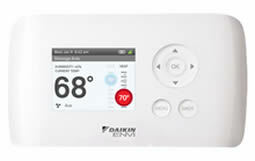 This Daikin thermostat is intelligent and easily programmable. This controller is mounted on the wall and has a user-friendly menu list with an LCD that allows homeowners to view and control their indoor comfort temperature settings quickly. One can input a weekly schedule, a vacation schedule including weather forecast to help them set appropriate temperature settings. 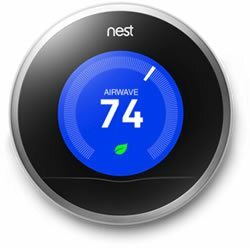 The greatest advantage of ENVI thermostats is the fact that it is a controllable Wi-Fi thermostat, meaning a user can access the thermostat settings from their mobile devices with an internet connection that allows them to make any suitable changes. 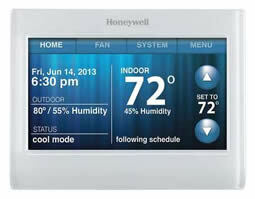 Honeywell thermostats are designed with the end user in mind. They feature simple-stat operations for smooth operation and a touchscreen that allows for periodic scheduling from the comfort of their personal computers. Some also have a touchscreen feature that is customizable to user preference. Daikin thermostats help give homeowners the peace of mind of knowing that their indoor air is at their preferred temperatures at all times, and it even notifies them when there is a potential problem thus helping them avoid an uncalled emergency. Find your nearest Daikin dealer in Alaska, Washington, Oregon, and Idaho, Pacific Northwest for more information on which thermostat is best suited to your home.